A rash that appears after eating can be related to various conditions, such as an allergic reaction, contact dermatitis or eczema. Each rash is the result of specific foods causing chemical reactions in the baby's body. If the child is still on an all-liquid diet, she may have a cow's milk allergy. If she's eating solid food, other common food allergens may be playing a role in causing a rash. If a rash appears on your baby's face after eating, make an appointment with your pediatrician for proper diagnosis and treatment options. Food allergies are most commonly found in babies and young children. The most common food allergy among babies is a cow's milk or soy allergy from the formula they are being fed, according to the Baby Center. A food allergy occurs when the baby's immune system mistakes the proteins from the dairy or soy-based product as a harmful substance. The body attacks the proteins with antibodies and histamine. Histamine leads to inflammation and irritation in the skin, causing a rash. Hives is the most common allergic rash that would develop after a baby has just consumed her bottle. The top highly allergic foods are fish, eggs, cow's milk, nuts, wheat and soy. 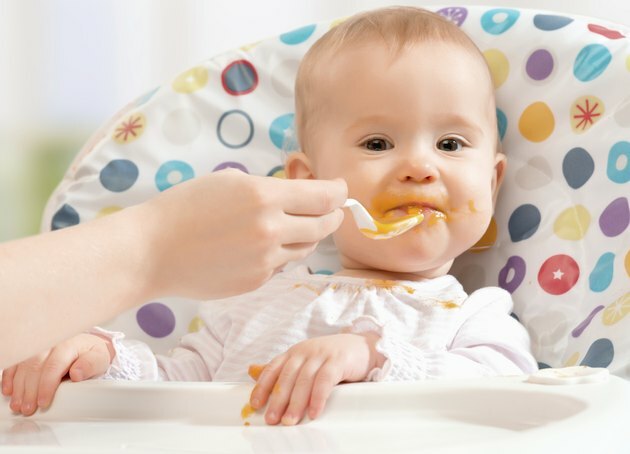 If the baby is eating solid foods, contact dermatitis is a common skin rash that only reacts in the localized areas where the food has touched the skin. Medline Plus states that the condition will cause inflammation, tenderness of the skin, redness, itching, warmth and skin lesions on the skin. The rash may blister, ooze and crust over if itched. If your baby develops contact dermatitis after eating a particular food, wipe the baby's face with a wet paper towel to remove any residue and call the pediatrician. After the baby's face is wiped, the rash should subside within an hour. Common foods that can cause contact dermatitis in a baby after eating are tomatoes and peanut butter. Eczema, or atopic dermatitis, is a chronic skin rash condition that is mostly found in babies and young children. Babies with a family history of asthma and allergies are more likely to develop eczema, according to Kids Health. The chronic rash is triggered by various elements, such as the weather, environmental factors and foods. Some foods, such as soy, milk and nuts can trigger an eczema flare-up. If the rash is eczema, it will most likely appear on other parts of the body along with the face. Does What You Eat Affect Your Breast Milk?